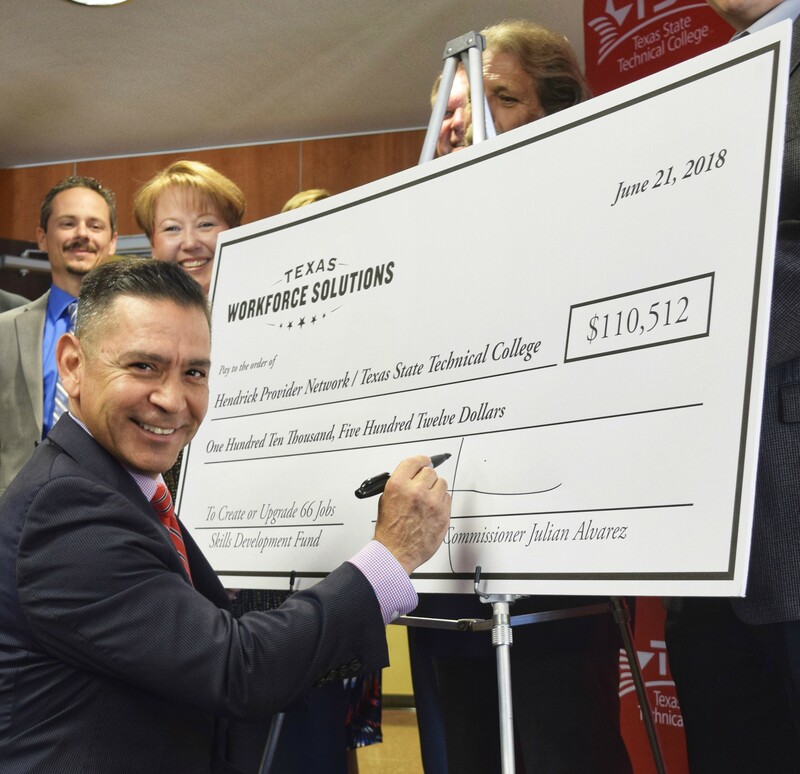 (ABILENE) – Leaders from Texas State Technical College, the Texas Workforce Commission and Hendrick Provider Network gathered Thursday to commemorate a TWC Skills Development Fund grant. The original grant amount was $110,512, which created or upgraded 66 jobs at the health care provider, but an amendment to the grant added another $121,044 and helped an additional 58 employees. “We offer a great solution to working with industry partners and are fortunate to work with the TWC,” said Rick Denbow, provost of TSTC in Abilene. Of the employees trained, 24 became certified medical coders, 10 became certified medical office managers and 35 earned certificates in medical front office skills. TSTC’s Workforce Training and Continuing Education partnered with the Practice Management Institute to fulfill the training. Some of the classes Hendrick employees took at TSTC dealt with insurance claims processing, procedural terminology, advanced coding and auditing. Riney said the training has led to increased tenure among employees and an empowerment in knowledge and competence. 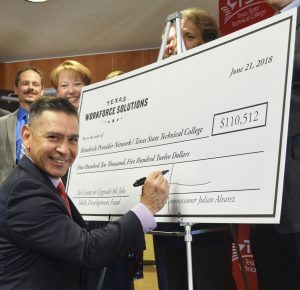 The regional economic impact of the grant is expected to be $1.2 million, said TWC Commissioner Representing Labor Julian Alvarez III, who presented the check. Hendrick Provider Network in Abilene is a multispecialty group with providers in cardiology, infectious disease, nephrology, orthopedic surgery and other medical fields. It is part of the Hendrick Health System. “Hendrick is one of our primary employers, and their growth is critical to our economy,” said Justin Jaworski, executive director of the Abilene Industrial Foundation. The Skills Development Fund has been used since 1996 to localize workforce training for Texas companies. This enables companies to work directly with local partners to develop training tailored to employees’ needs. The competitive grant has assisted more than 4,200 employers statewide, according to the TWC. This entry was posted in Abilene on June 21, 2018 by Daniel Perry.